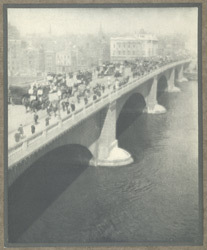 From a "dry steep bank upon which prehistoric London rose" to "the comparatively narrow belt of marsh upon the south, London Bridge was thrown: a causeway united the bridge across the marsh to the higher land which the road from the Straits had been persuing, and once that bridge was thrown across the Thames the nodal point of London was established. At that point would cross the stream of travel and of commerce going from the Straits northward to the military capital at York, to the Irish Sea, to the Barbarian frontier upon the Solway or upon the Clyde, to the garrisons in the marches of Wales, to the wealthy cornlands of what was later East Anglia. At that point all those streams of commercial and political energy would cut across the old east and west highway of the Thames.